A Tucson family says U.S. Border Patrol agents arrested and separated them Tuesday. TUCSON, Ariz. — TUCSON, Ariz. - A Tucson family says U.S. Border Patrol agents detained them Tuesday, sparking immigration advocacy groups to call attention to the incident. No More Deaths and the Southside Presbyterian Church are supporting the family. The groups released video of the incident Wednesday morning. According to the Department of Public Safety, troopers stopped the family's vehicle to check for illegal window tint. Officers say the vehicle was not registered to any of its occupants. The driver, identified by the family as Glenda de la Vega Fernandez, gave the trooper documents inconsistent with the car's registration as well as suspicious foreign ID, the DPS says. It was then that the trooper called Border Patrol for assistnace. The Border Patrol says they arrested Fernandez, Jesus Antonio Torres, and their 12-year-old daughter Dariana Torres de la Vega, who was in the car at the time. After the family was detained, a bystander crawled under the Border Patrol truck to prevent it from leaving. He was arrested and later released. Officials say, the bystander was not related to the family. A news release from the family says the parents and child were later separated at Border Patrol headquarters. Tucson’s Police Chief and Pima County’s Sheriff have said they do not put a priority on reporting suspected illegal immigrants to Federal authorities. They say they do not want to make undocumented people afraid to report crimes in their communities. There is a state law instructing police to report when they have a reasonable suspicion someone is in the U.S.illegally. DPS is a state agency. The Department’s most recent annual report does reflect some immigration enforcement but shows the agency is much more active on matters like traffic enforcement and drug interdiction. The report says the DPS Border Strike Force arrested 77 it called suspected illegal aliens, and a special gang and immigration unit reports it referred 41 people to Federal Immigration and Customs Enforcement. A news release from the family and the church say they have lived in the country for 11 years and have two other children, ages 10 and 6. In a news conference at Southside Presbyterian, family and friends expressed outrage at the arrest and called for the family’s release. The mother of the detained man fainted and needed medical attention. While activists say the 12 year old girl was separated from her parents overnight, Border Patrol says they were allowed to stay together. 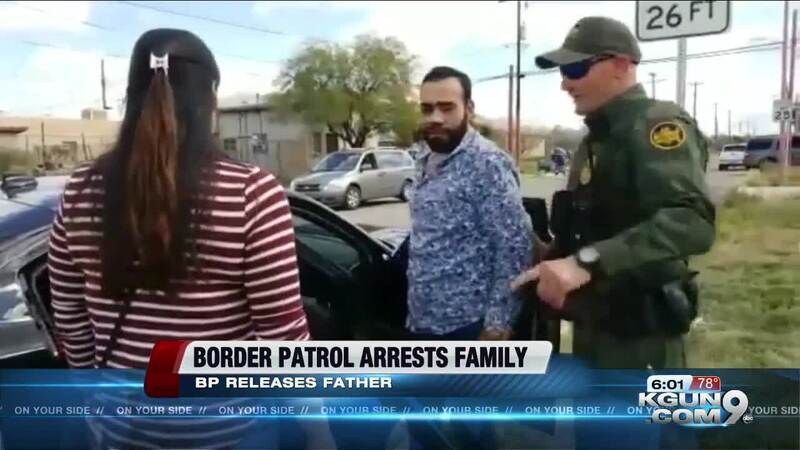 As of late Wednesday, Border Patrol says the father has been released on bond.